Juvederm Volbella is the newest hyaluronic acid filler to gain FDA approval. While it gained its FDA approval in June 2016, it has been used in Canada and Europe for several years. Juvederm Volbella is the latest advancement in the trusted family of Juvederm products, and it has been specifically created for treatments to the lips and around the mouth. Juvederm Volbella is a soft, smooth gel suitable for adding subtle volume to the lips and softening the appearance of perioral lines. The gel fills in lip lines and wrinkles while the hyaluronic acid within attracts and retains moisture, so results can last up to one year. As a prominent leader in injectable treatments, Dr. Greene was selected by Allergan as one of the first physicians in the United States to offer Juvederm Volbella. WHO IS A CANDIDATE FOR JUVEDERM VOLBELLA? Virtually anyone who desires non-surgical lip enhancement, as well as smoothing out fine lines and wrinkles, is a candidate for treatment with Juvederm Volbella. Some patients desire natural, fuller lips while others want to smooth out wrinkles and lines around the mouth (also known as perioral rhytids). Patients with lines around the mouth or a poorly defined vermillion border (the junction of the red lip and white lip) may benefit from improved lip definition. This treatment can be performed safely on patients who desire immediate correction minimal downtime. Dr. Greene is an injectable specialist who is considered to be a leading expert in facial fillers. He is a national trainer for both Allergan and Galderma and trains other physicians how to properly inject. In 2015, Dr. Greene was one of the busiest Galderma trainers in the United States. Dr. Greene was selected as one of the first offices to obtain Juvederm Volbella, and he will serve as a trainer to instruct other practitioners how to properly and safely use this new product. Dr. Greene was trained as a facial plastic surgeon, while led to the development of his innovative anatomic approach to his customized filler treatments. His vast experience and artistic vision help him to create more natural, longer lasting results. As one of the top injectors in Florida, he customizes treatments for each patient, which often includes a combination of different fillers and techniques in order to achieve the best outcomes. Dr. Greene has dedicated his practice to non-surgical facial enhancement and rejuvenation, much of which involves facial fillers. After having performed over 20,000 treatments, he is one of the busiest and most accomplished injectors in the United States. He has also published and lectured extensively on Botox and injectable fillers, and he was a contributing editor for a textbook on Botox and hyaluronic acid fillers (Juvederm and Restylane). 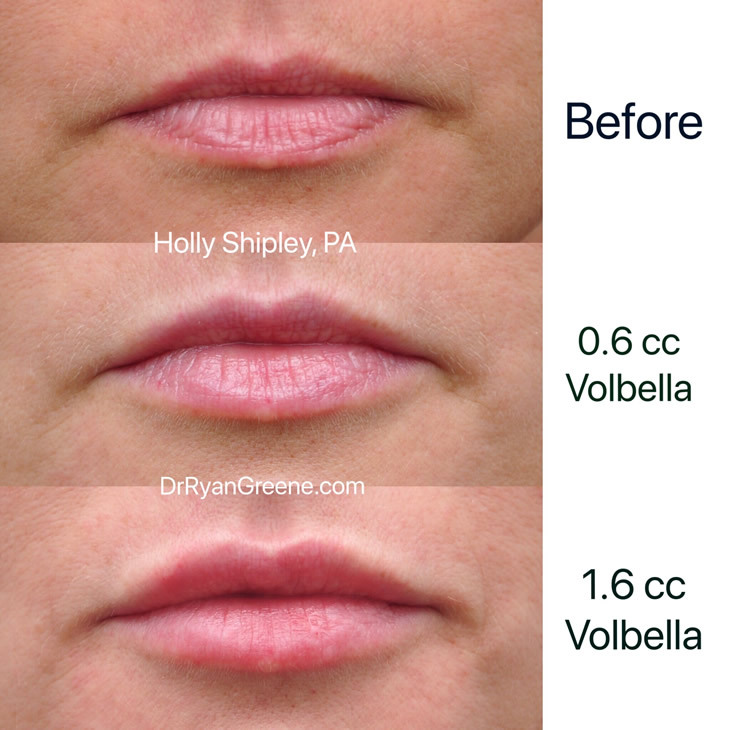 WHAT IS VYCROSS TECHNOLOGY THAT IS FOUND IN JUVEDERM VOLBELLA?or WHAT MAKES VOLBELLA DIFFERENT? Juvederm Volbella was developed with VYCROSS technology to deliver a natural look and feel, with results proven to last up to a year according to clinical trials. VYCROSS is a proprietary filler technology from Allergan, which yields smooth products that have been engineered to address specific patient concerns such as lip fullness, age-related volume loss in the cheek area, or perioral rhytids. Allergan first described this innovative VYCROSS technology in the U.S. in 2013 with the FDA approval of Juvederm Voluma for cheek enhancement for age-related mid-face volume loss. Juvederm Volbella is the latest addition to the Juvederm family and will be an excellent option for Dr. Greene's patients. HOW DO YOU AVOID MAKING MY LIPS LOOKING LIKE THOSE FAKE ‘DUCK LIPS’ THAT I ALWAYS SEE? Creating a natural appearing lip requires artistry, good judgment, and excellent technique. Unfortunately, there are a number of injectors who produce unnatural, over-injected results. Dr. Greene takes pride in creating natural appearing lips, and is sought by patients throughout Florida for his lip enhancement procedures. Patients regularly travel to Dr. Greene from outside of the state and from the Caribbean as well for their filler treatments. The results of lip enhancement vary from patient to patient. However, in experienced hands, the results of a lip enhancement should last for between six and twelve months. Many of Dr. Greene’s patients even notice some enhancement well beyond a year after treatment. WHAT CAN I EXPECT WITH A JUVEDERM VOLBELLA TREATMENT? Dr. Greene’s specially formulated topical numbing cream is applied for 15 to 20 minutes prior to treatment. Treatment takes approximately 15 to 30 minutes to perform. The treatments involve very small needles, and are virtually painless due to the numbing cream and Dr. Greene’s gentle injection technique. In fact, Dr. Greene is well known in the South Florida area for his gentle technique. Patients may return to normal activities immediately after treatment. WHEN DID JUVEDERM VOLBELLA GET FDA APPROVAL IN THE UNITED STATES? Allergan announced on June 1, 2016 that Juvederm Volbella received approval from the U.S. Food and Drug Administration (FDA) for use in the lips for lip augmentation and for correction of perioral rhytids, commonly referred to as perioral lines. In clinical trials, Juvederm Volbella was found to effectively increase lip fullness and soften the appearance of lines around the mouth in a majority of subjects through one year. Juvederm Volbella was first approved in Europe in 2011. Currently, it is distributed in more than 70 countries, including markets in Europe, Latin America, the Middle East, Asia Pacific, and Canada.